Something not behaving as expected? This section will outline some commonly helpful solutions. If you’re still not having a zen experience, please get in touch for some 1-on-1 support. Ensure you’re going ​directly to focus.nirvanahq.com or using the latest version of the app for Android or for iOS. If you can’t log in, click Forgot Password? and enter the email or username associated with your Nirvana account. Click Reset my password. This will let you know if you’re entering the correct information. If so, Nirvana will send an email to the address associated with the account. Click the link in the email you receive and follow the instructions to create a new password. You may now log in with your new password. Go ​directly to focus.nirvanahq.com every time you want to use the app. If necessary, it will redirect you to the login page. After entering your information, you should remain logged in on this browser. This assumes that your privacy settings are set to remember your logins and that you aren’t using a public or shared computer. ​If that doesn’t work, try the above with another browser. If you stay logged in with the new browser, you may need to check your privacy settings on the browser that wasn’t working. Make sure that you’re using the latest version of the app for Android or for iOS. If you’re already using the latest version, try reinstalling the app. This helps for most people experiencing the issue. If you’ve tried the above and you’re still getting the bump, please contact us with the relevant email address or username, as well as the device(s) on which you’re having the issue. We’re happy to help. Ensure you’re going ​directly to focus.nirvanahq.com or that you’re using the latest version of the app for Android or for iOS. Do a search for the task. If you find its master recurring task, pause it. If you don’t find the master recurring task with a search, it’s likely in the trash. Empty it and it should stop replicating. Good to know: If you want to permanently delete a recurring task cycle before its end date, you should first pause it, then move the cycle to the Trash. If you’ve tried this and you’re still seeing deleted tasks in your lists, please contact us with the name of the tasks and where you’re seeing them. We’re eager to help out. Verify that your time zone is correct by logging in to your account dashboard and looking under Profile. Here, you’ll see your time znone as a plus or minus value offset to UTC: Universal Time, Coordinated. If you see an unexpected time zone, make sure that your device, as well as the network(s) used for your connection, are set to the right time zone for your location. Then log out, log back in, and check your time zone again. If you’ve tried the above and you’re still having trouble, please contact us with the details and we’ll help you pin down the cause. 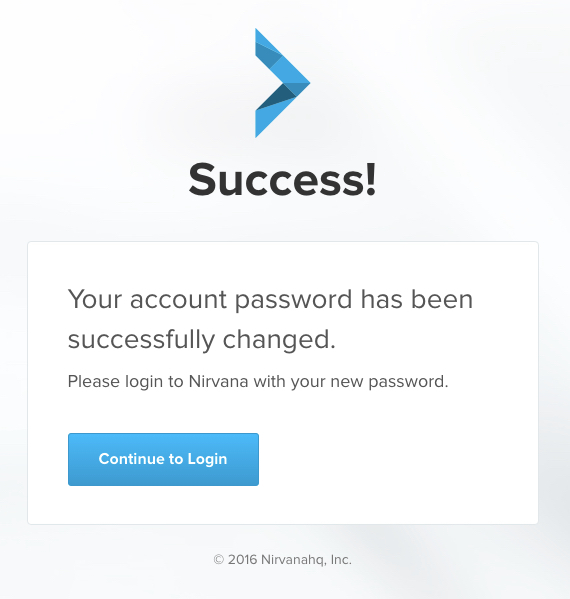 Check the email address that you use to log in to Nirvana. This is where your Focus list emails will be sent. If you did not receive the email, double-check your Focus list email settings to make sure it should have been sent today. Lastly, check the time zone setting in Nirvana, since emails are sent just after midnight. If the time zone is incorrect, log out and back in to reset it. If you’ve tried the above and you’re still not receiving your Focus emails, please contact us for help. Please let use know which e-mail address you expect to receive your list, when you should have received it, and if you notice any time zone issues. This will help us find a solution for you. Your Nirvana data should sync between your devices. If it’s not working as you expect, please take a look at these steps. See if you’re using the latest versions of the app. This will get you off on the right foot. Make sure you are using the same account on both devices. when you want to update information to or from a device, ensure that the app is open and that you have access to a network connection. If you have 2 instances of the app focused at once (ex: on your computer and phone), you will need to refresh the unsynced one. To do this, tap the refresh icon in the web app or pull down on any list in the mobile app. When only 1 instance is open while connected to a network, the sync should be seamless (no need to refresh). If you’re still having trouble, please sign out and sign back in. Please note that using Android’s “lock apps” feature with Nirvana will prevent syncing. Please remove the lock by going to your recent apps screen and pressing the lock icon on Nirvana. If you’ve tried the above and things still aren’t working as expected, reach out. Please let us know which device and operating system you’re using as well as if the issue spans all items or uniquely certain types. This will help us get things back on track for you. You’ll see all of your Inbox items regardless of global area filtering, even if they have area tags. However, you can filter your Inbox by area just like you would with any other tag. You can learn more about Global area filtering in this article. If you still have questions, please contact us for more information. Logged project actions will be visible in the project’s Done group until the project itself is completed and logged. However, you can click on Done above these actions to hide them. To learn more about organizing Done items, take a look at the logbook. If you have questions about how your Done and logged actions are organized, please contact us for details. Save the note before looking for the checkboxes. If you’re using the mobile app, ensure that Collapse Notes is disabled from within your settings. Fully expand your notes and you should see the checkboxes. If you’re still having trouble creating checklists, please contact us for personalized 1-on-1 support. Make sure you’re using focus.nirvanahq.com or the latest version of the mobile app for Android or for iOS. Ensure your item notes are fully expanded before you click the link. In the mobile app, tap the item to show its details (without proceeding to the Edit Notes view), and access the link there. Check the link itself for typos and accuracy. If you’re trying to link a phone number, ensure it’s written in one of the accepted formats. If it’s not a phone number, try copying and pasting the link into a browser. If it doesn’t work, there’s likely an issue with the link you’re using. If the link checks out, you may want to try another type of link in Nirvana. If other types of links work, there may be an issue with your browser. Test the link in Nirvana using another browser. If you’ve tried the above and you’re still having trouble, please contact us with notes about the link you’re trying to access and the device you’re using. We’ll be happy to help you find a solution. See a term or phrase that’s not clear? Find the definition.